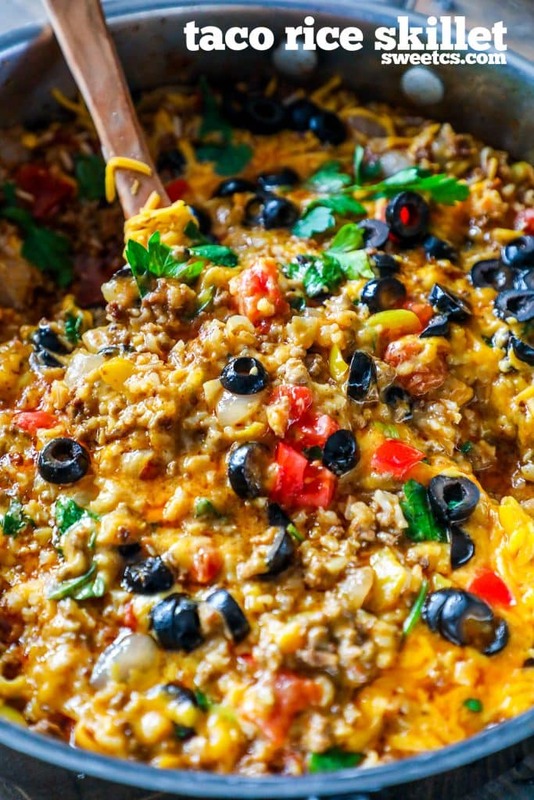 This one pot taco rice skillet is an easy taco and rice burrito bowl dinner in just one pot – bursting with your favorite burrito flavors, with almost no cleanup! 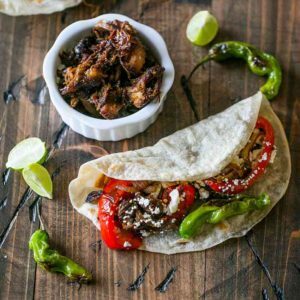 Perfect to feed a crowd on a budget and in s many different dishes from burritos and salads, to as-is straight out of the skillet! In a quest to make more effortless meals that work well in leftovers, I’ve been trying to come up with more one pot meals. 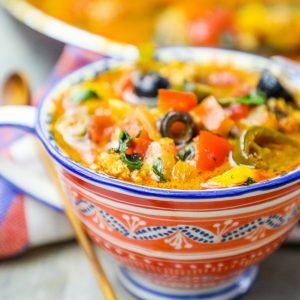 There is something fantastic about the one pot meal- not only is it easier to only have to clean one pot, but they tend to be simpler, easier recipes that are perfect for busy families who need warm, comforting meals to come around at night. JUST TAKE ME TO THE ONE POT TACO AND RICE SKILLET RECIPE ALREADY! 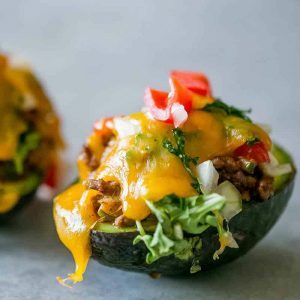 If you’d rather skip my (very helpful, i think) tips and tricks, essential cooking info, and similar recipe ideas – and get straight to this deliciously easy Taco and Rice Burrito Bowls Skillet Recipe – simply scroll to the bottom of the page where you can find the printable recipe card. 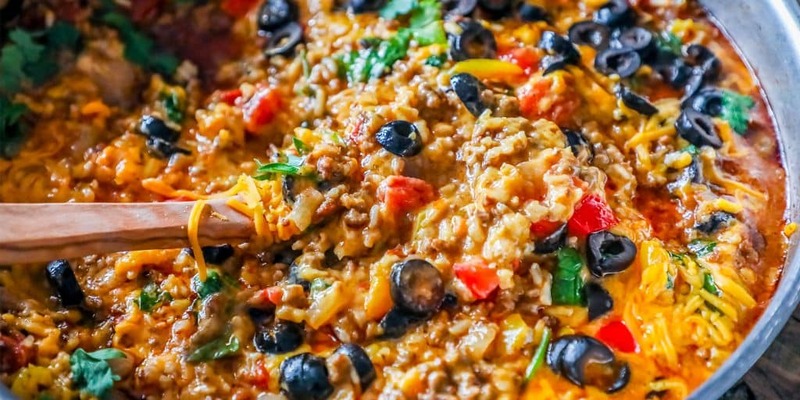 This taco and rice burrito bowl recipe is so simple, you can change it up with your favorite ingredients if there is something you want to add or want to switch out. Have fun and be creative when making your one pot spicy taco skillets! Chopped broccoli florets add a delicious crunch and tons of nutritional value to taco skillets. Substituting ground chicken or turkey lighten this dish up considerably. 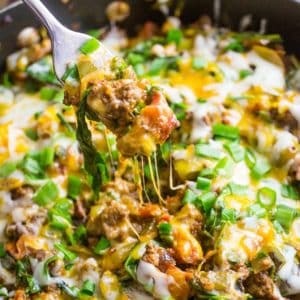 Adding cauliflower rice instead of rice makes this a keto or paleo low carb meal your whole family will love. Swapping chorizo for ground beef will kick our taco skillets up a notch. Adding 4-6 oz velveeta will make this dish totally creamy, thick, and indulgent. Black beans or pinto beans give protein and a ton of flavor to this skillet. Sliced jalapenos and olives on top give great color, texture, and a bit of extra kick! I got the idea for this burrito bowl/ one pot taco skillet from my good friend Melissa’s One Pan Chicken Burrito Bowls. Melissa is the queen of one pot meals- and these look so insanely delicious! 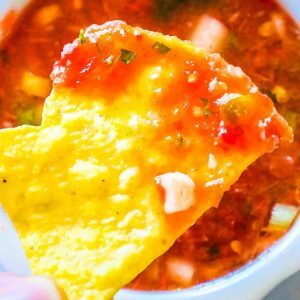 Be sure to check out her recipe- she even has a burrito bowl recipe that you can cook in the slow cooker! I made my dish a little more rice based to eat more like a side dish- it is fantastic in tacos, salads, burritos- and even in stuffed peppers! Of course, this rice skillet is also fabulously delicious on its own- I got a bit carried away sampling it straight out of the pan! Add your taco and rice skillet dinner to large iceberg or romaine lettuce leaves for a deliciously festive and fun taco lettuce wrap. Toss your taco and rice skillet into burritos for an easy complete meal. 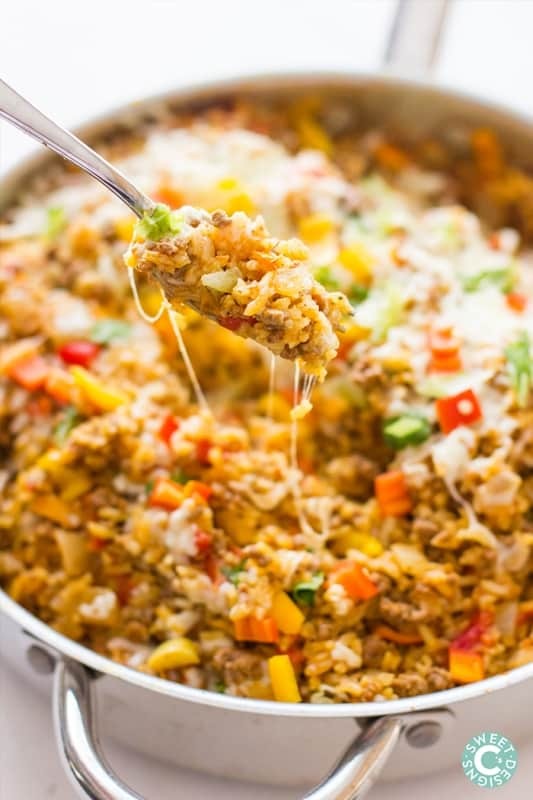 Add to tacos and bake in the oven for 10-15 minute for the ultimate Taco and Rice Skillet Baked Tacos. Spoon heaping servings of your taco and rice skillet over a salad for a tasty lighter lunch. Stuff into peppers and bake for 15-20 minutes until pepper is soft for delicious stuffed peppers. 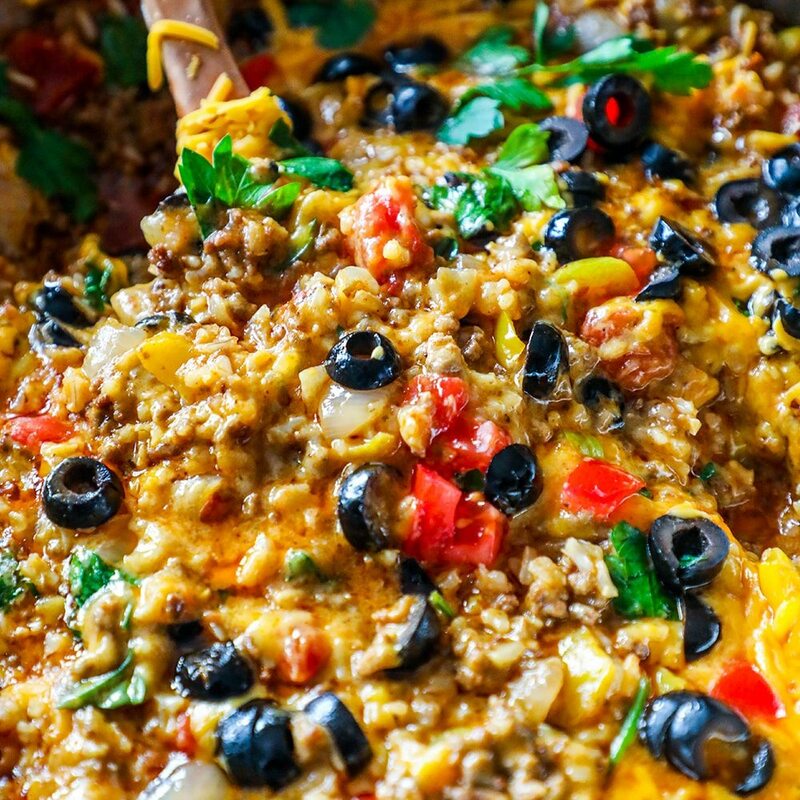 This one pot cheesy taco skillet isn’t just knock out delicious the day you make it – this is a meal you can buy and make in bulk, and freeze for future meals, too! I actually make a big double batch every time I make this because it saves so well- you can even freeze it in a high quality freezer bag. 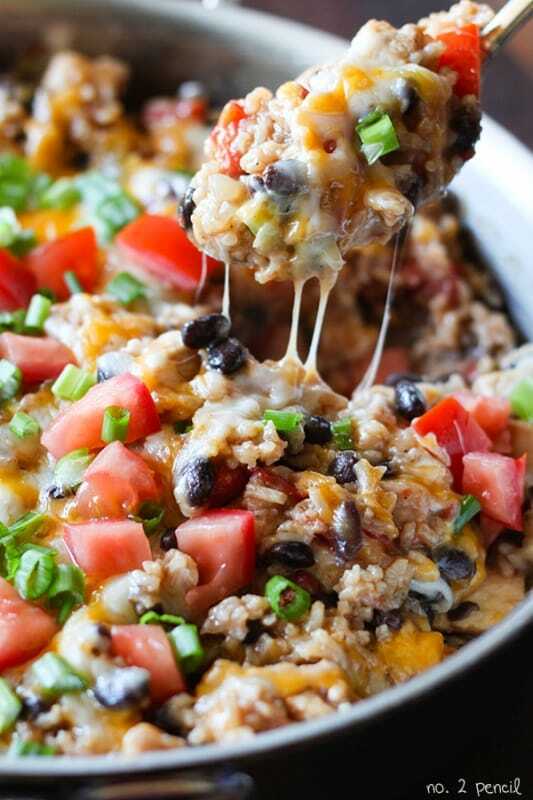 If you have lots of taco skillet leftover – never fear! I actually think this recipe tastes even better a few days after making it- and since it is so versatile, you can add it to different recipes each day without feeling like you’re eating the same leftovers again and again. Store in a plastic bag in the freezer for up to 2 months. When reheating, I prefer adding back to a skillet with a bit of oil and pan sauteeing instead of microwaving for the best flavor and texture. 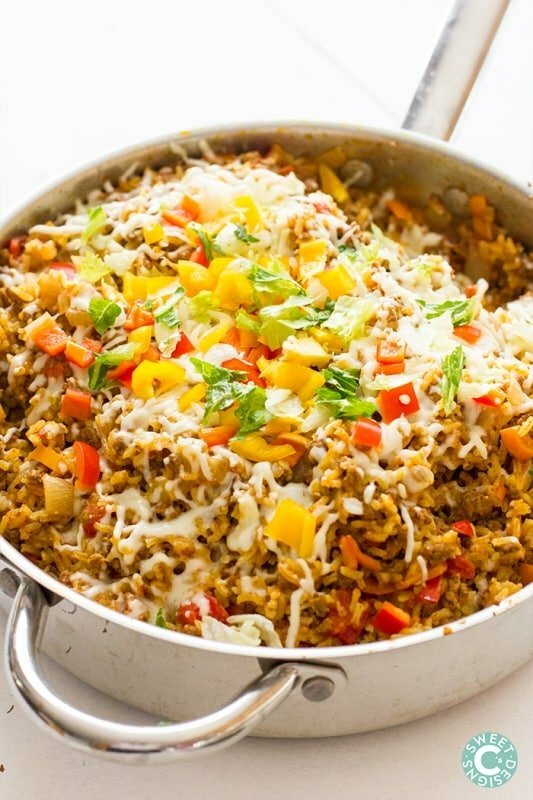 If you love this Easy One Pot Taco and Rice Skillet Recipe as much as I do, please write a five star review, and be sure to help me share on facebook and pinterest! Any recipe that uses one pot to cook in, is a plus in my books. This is a very tasty dish. No other sides were needed. This was super easy and my three girls and I loved it. Many thanks! This was just so tasty!! Thanks for sharing. How many servings would you recommend? And would you eat this as a full meal or strictly as a side? I often give myself one serving to two servings (depending on how starving I am), and I love to put it over lettuce to be a large all-in-one meal. Sometimes though we will spoon this directly into taco shells or tortillas and then serve with a salad or beans on the side. It’s really adaptable- try out lots of twists to find what you love! This was very very good everyone loved it. I added corn and if I make this and my son in not home I’m going to add kidney beans! I made this for supper tonight. It was very good. I’m diabetic so I used cauliflower rice instead of the rice. Husband didn’t even notice. That’s awesome! We just got really into cauliflower rice… it is so good! This is a delicious recipe!! I spiced it up with some fresh jalapeño and added some lemon & black olives. Delicious! Thanks for sharing. Thanks for sharing this delicious recipe on Weekend Bites! Find it on April 23rd’s features on Practical Parenting Ideas! It’s hard to go wrong with taco seasoning, and with this skillet it looks like you got everything right! This sounds wonderful! My whole family loves Mexican and I love easy! this will definitely be on next week’s menu! This is one tasty skillet of rice! Fantastic recipe! 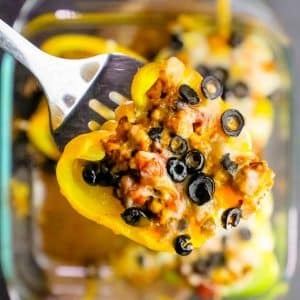 I am drooling over this taco rice! 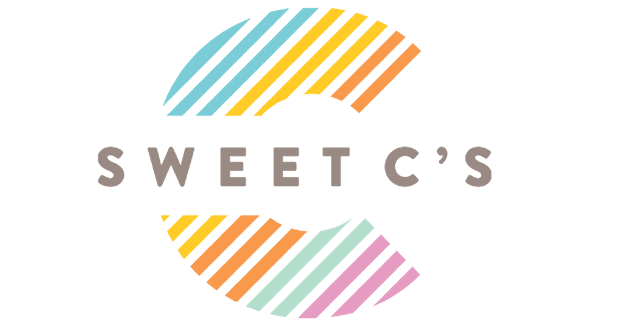 I will be featuring you this week, at Simple Supper Tuesday. We hope you can join us again, starting Monday night at 8pm, EST. Yum this looks great. I would love to try this dish. Mmmm! This makes me super hungry just looking at your pics! Pinning for sure! Adding this to my menu for next week! Thanks for the recipe! This was absolutely amazing …. I misread the recipe and only had minute rice on hand …. so I omitted the water and added 1/2 cup more rice and it was perfect …. thanks for the new meal!! About How long does it need to simmer? Some of that depends on your rice, where you live, etc- but about 10-15 minutes. Absolutely delicious! I added some frozen corn and drained, rinsed black beans and used ground chicken rather then beef. So flavorful!